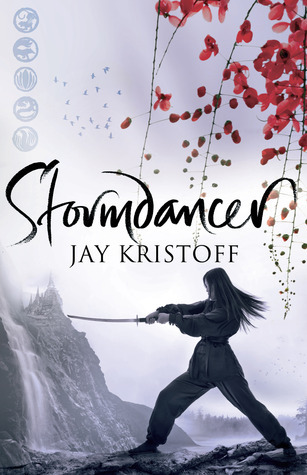 For this week’s topic, I’ve decided to feature the hero – or heroine, if you will – from the first book of Jay Kristoff’s The Lotus Wars, his YA trilogy set in a feudal Japanese-inspired steampunk fantasy world. 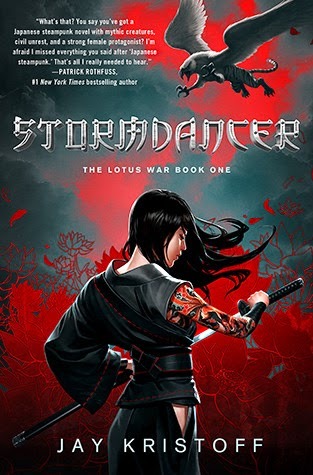 At the beginning of Stormdancer, our protagonist Yukiko and her father are forced to capture an arashitora – a “storm tiger” or griffin – for their megalomaniacal Shogun. However, their expedition is interrupted by a great storm, causing Yukiko to become stranded and separated from the group. She is set upon by one of the very creatures she was tasked to hunt, and a very angry one at that. Instead of tearing her to pieces though, the griffin, which Yukiko names Buruu, winds up bonding with the girl, and together, the unlikely pair rises up to challenge the rule of a tyrannical empire. I kind of love them all this week! In the end though, I have to say the Polish edition slightly edges out the other three. Just look at that detail. I would love to have this image as a poster. It’s a very moody cover, I agree! 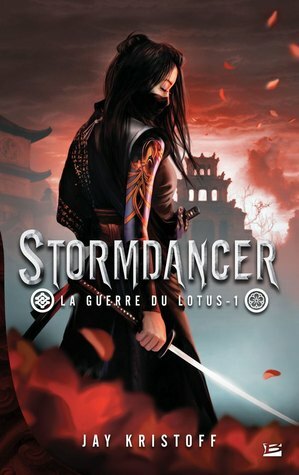 Although the French edition comes a close second, since it’s very intense. Yeah that one seems to be the popular one this week! Yes I agree with you there-that cover is gorgeous! That is definitely the one I’d pick as well. It’s so pretty! Definitely pretty! The details are just stunning! I agree, his books are definitely blessed by the cover gods! I have never heard of this series but I loved Nevernight by the same author!! The covers are gorgeous ❤ I agree with your favorite! I agree, this book got really lucky with covers! For once I prefer the French edition! Now that’s one series that’s been on my TBR a long time. I pretty much forgot about it until you brought it up. So, it’s a good series/worth it? Well, I bought the trilogy 🙂 There is also a short story or two. I think he’s done with it too. It’s been awhile since the 3rd book was released and I haven’t heard any rumors on his website about any others. As long as you aren’t bothered by 2 stories taking place in history and currently, both being told side by side, then I do recommend them. Awesome, thanks for the info! I actually think I might have the first book on my Kindle. Yeah, it was hard to choose this week, because I like the French and UK covers a lot as well. In the end I went with the one I thought was more dynamic, but it was close! I’ve only read Kristoff’s Nevernight Chronicles, I should check out his other stuff. This looks like something right up my alley. These are all pretty great covers too. Nice pick! This was the first series I ever read by Kristoff. I think the writing in it will feel a lot less polished now if you go back, and his prose has gotten way less purplish since, but it’s worth trying if you want to read it for the story! Wow – that is a fantastic cover. I can’t believe how far behind I am visiting everyone – I’m such a slouch! Still, I’ve finished stage 1 of the SPFBO which is what I intended. Now onto the review books! !